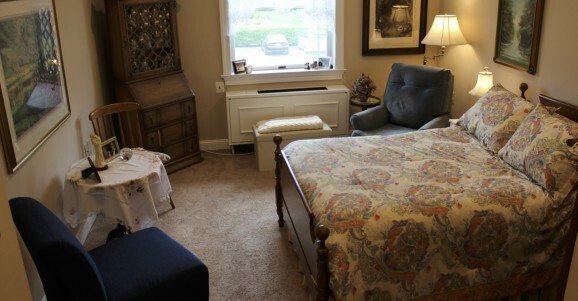 Residential Healthcare at Wiley provides assisted living services to our residents. The warm and inviting environment of our Hackett Memorial Residence and our Aldersgate Building includes individual studio rooms with private bathrooms as well as a variety of community areas. Our Residential Healthcare residents enjoy having all of their meals served in the Main Dining Room and access to a monthly calendar of planned events and activities. The monthly fee includes weekly housekeeping and laundry services as well as all utilities. Medication supervision, assisted bathing, telephone and cable television service are available for an additional fee. Option #1: Aldersgate Residence- adjoining rooms may be combined for couples within the Aldersgate Building. Option #2: Hackett Memorial Residence- three room types available on the first and second floor.